I know that everybody is amused by Coca-Cola talking to Aurora now, no doubt, this is another proof that cannabis business will be a top performing sector of 2018. Aurora is still a good deal, so if you have money, go and buy some shares, it is going to perform well – rising maybe even 100% within next 12 months. Yet, Pure Global has a market capitalization of CAD 56 million and price of CAD 0.38 at the moment. Very little company compared to its peers that are all around the news. Fact is that most of the cannabis stocks are the scam and for novice investors, it is a gamble to choose the right one. Therefore, it is important to understand this speculative sector and be able to recognize the right business elements of marijuana investing. After careful analyses, we believe that Pure Global Cannabis brings a potential to profit exponentially in the upcoming future. We are not talking about 100% increase, we are talking about 1000% or 2000% increase like some of the other pot stocks during the first cannabis investing spree during past years. Pure Global Cannabis partnered for the ongoing supply of pharmaceutical and nutraceutical grade Cannabidiol (CBD) isolates with Isodiol International – a market leader in pharmaceutical grade phytochemical compounds and the industry leader in the manufacturing and development of consumer products. PureSince, a wholly-owned subsidiary, has partnered to buy additional medical cannabis for resale from The Supreme Cannabis Company. Pure Global Cannabis agreed with Avicanna Inc. to acquire 60% interest in Avicanna’s subsidiary Sativa Nativa S.A.S. in Colombia and option to acquire an additional 15% later. Sativa Nativa has been issued a license for the cultivation of psychoactive cannabis and a license for the manufacture of cannabis derivatives by the Colombian Ministry of Justice and Ministry of Health. This is quite BIG NEWS because Colombian marijuana growing is much different than growing in Canada due to its much better climate condition. Additionally, you can hardly find a company to trade on the Colombian stock exchange. Very few companies have a partnership with Colombian growers yet. This is an outstanding advantage! PureSinse will become a merchant partner for the launch of BuyWell.com, which aims to be the preeminent Canadian marketplace for health and wellness products and services. Pure Global Cannabis is focusing not only on the Canadian market but also internationally with special focus in the United Kingdom. UK medical cannabis legislation is facing historical changes due to extremely increased public awareness of all the positives that CBD products bring to a medicine. The UK market would be twice bigger than the Canadian medical marijuana market. The company has an outstanding technique of plant cultivation. It maintains the multi-ponic vertical cannabis farms. In such a way it can focus the energy and space on super-quality flower yielding more than three times the product of a similar footprint without pesticides or herbicides. As a result, Pure Global is able to produce much more product at a lower cost that will bring a lot better numbers on the balance sheet compared to its peers. Pure Global Cannabis started to trade on the TSX Venture Exchange in the first half of July 2018 – not a long time ago! As a matter of fact, its first month of trading was a period when entire cannabis sector was consolidating downwards (see why are marijuana stocks dropping?) and thus, nobody would have ever bought that without appropriate fundamental factors that were released later. Hence, the stock has consolidated in form of the symmetric triangle until its completion. 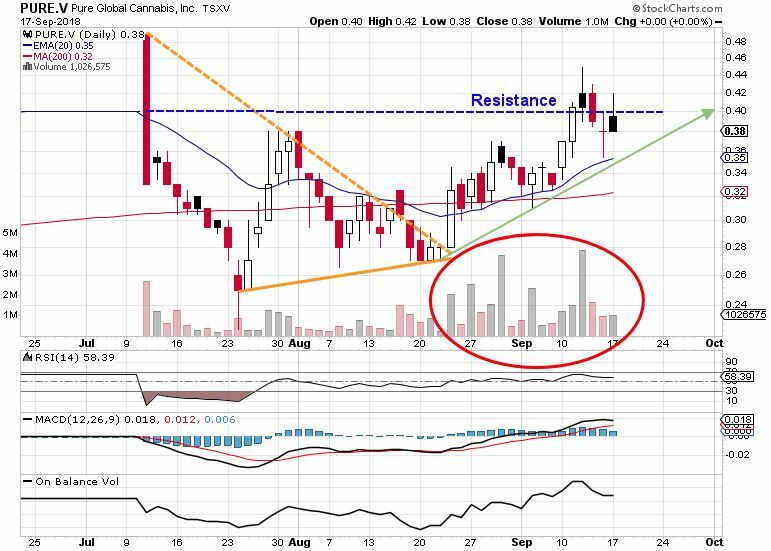 As the industry changed direction upwards, the Pure Global Cannabis’ fundamental and strategic image also started to shape up, which was quickly recognized by smart investors – see the significantly increased volume levels in a red circle. The active traders managed to quickly recognize the importance of 20 EMA as a short-term support that is being bounced at the moment. The stock price has already managed to break its top resistance of 0.40 and it looks like it is going to smash it again. All technicals such as RSI, MACD and On Balance Volume are showing very trendy behavior even though for such a young stock they are not really meaningful. Pure Global Cannabis Inc. is a fabulous investing opportunity in long-term. The company is focused both on domestic as well as on the international market. At the moment only a few of the smart investors have discovered this young and ambitious company. Taking an ownership in these early stages of the most speculative industry of this year may bring exceptional profits in upcoming years or maybe even months. If you wish to stay informed about further cannabis ideas, stock picks or opinions, simply subscribe to our future posts entering your e-mail in a right sidebar.